What to expect from diving? Depending on the time of the year, you can see bull sharks and whale sharks. All year round – turtles, barracudas, sea horses, schools of fish, occasional reef shark & nurse shark. Experience level? Any level is accepted, however to dive with the bull sharks you must be certified and have at least 20 dives under your belt. How to dive in Cancun area? From resorts with dive shops on site or private accommodation, using any dive shop. What else should I know? Diving is not allowed with the whale sharks – snorkelling only! If you are not a certified diver you may do your courses during your vacation. It is better to stay in Playa del Carmen or Tulum area, there is no good diving in Cancun city. I HAD THE PLEASURE OF WORKING IN PLAYA DEL CARMEN AS A DIVING INSTRUCTOR! I happened to find myself in Mexico without a job and a place to live, but a big urge to dive. Amazing sunshine, white sandy beaches, beautiful resorts, many dive shops and promising Caribbean Sea are calling. I quickly found a job with a professional dive center at a resort and had the pleasure of diving almost everyday for about 10 months, enjoying beautiful reefs full of colourful coral, lots of fish, sea turtles and sea horses. ... HOW DO YOU GET TO PLAYA DEL CARMEN? 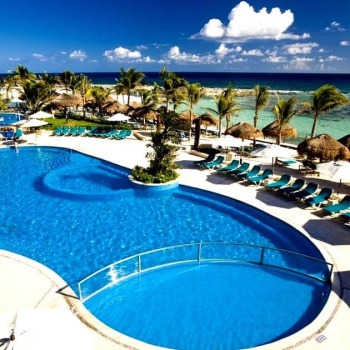 You’ll need to fly to Cancun and either get transfers with the resort or purchase a bus ticket. Taxi drivers tend to take advantage of the tourists and usually charge them triple the actual price if not more, so I recommend taking the bus that will take you to the bus station located on the 5th avenue in Playa del Carmen – the heart of the city, near the beach and close to most accommodations. Taxis within the city are around 30-40 pesos (2 dollars). SHARKS IN FRESH WATER? REALLY? Our dive center started bull shark dive trips in December, this is usually when we can be sure the bull sharks are there. They mostly hang around one dive site called Jardines, it is right in front of the famous beach Mamitas. Don’t tell your friends chilling on the beach – they might be afraid to step into the water 😊 The cool thing about bull sharks in this area is that you can often see pregnant females, which makes them look even bigger 2.5-4m long typically – they come to give birth at the entrance of Cenotes. Cenotes are fresh water caves in the jungle that are connected to the ocean. You will learn about Cenotes in our next vlog, they are truly fascinating and admired not only by diver, but also by the bull sharks! You must have 20 dives under your belt, have good buoyancy and love for sharks to be able to go diving with them with a reputable dive center. If they tell you that its ok to dive if you’re newly certified – don’t trust this operator. You need to follow special procedures on these dives and if you fail to do so, you can get yourself and the group in trouble. Do not be alarmed – following procedures, knowing your limits and having enough experience is always best when being around wild animals, even though that they are very cute and sweet creatures! WHAT ABOUT THE WHALE SHARKS IN CANCUN? These gentle giants come to Cancun area in summer to feed. By Mexican laws you are not allowed to intentionally dive with them, however, many dive centers organize snorkelling excursions. You would leave from Punta Sam – a harbour in Cancun and spend the whole day looking for whale sharks and snorkelling with them. Most boats only fit 10 people, minimum age is 5, however you should check with your dive center, since this may vary. You go snorkelling with a guide who takes 2 people in the water at a time. Whale sharks are huge, so they move very fast and at times you only have less than a minute to swim close to them, however, you get into the water taking turns and can do it as much as you like. If you’re lucky you may see a few whale sharks “hanging in there” right under the surface. They barely move and looks like they are sleeping. They are actually feeding this way. It is an unforgettable experience. (Min) 7 Nights 01-30 Jun 2019 | Mexico.